However I believe that Federica Pellegrini clocked a 1.55.45 in Budapest which is slightly faster than Manaudou's winning time in Melbourne. Good spot Sylvain. Its changed now. Do you mean Camile Lacourt for the 50m back or Liam Tancock? I mean Camille Lacourt, I've changed his nationality to French now (would be great if he was British though). Glad this is of use. Sara Isokovic swam 1:54.97 in the 200 free in Beijing and won silver in the textile Arena R-evolution (the one with the crossing blue lines, no polyurethane). That should count if you want all textile. Ditto Pellegrini's 4:01.53 in the 400 free from European Champs that year, in the same textile Arena suit. not related, but did pelegrini wear 2 suits when she swam 4:01.53? I'm looking at this, and I see perfect support for the suit WRs staying put. In light of recent performances (you know who I'm talking about), every men's textile record is under threat this summer-- even the ones that weren't expected to be approached just 2 years ago. I'm willing to bet that the majority does fall. I think the women's records are sightly stronger but you get the point. btw this is a side note, what suit was Paul Biedermann wearing when he swan 144.71 and 144.88 in 2009? paul biedermann was probably wearing the 2008 arena suit made for the olympics because alain bernard was the first to use the 2009 arena suit that the rest of the arena team wore in rome. i think we should remove all times from 2008-2009 shiny-suit-time (ex: Isakovic in 200m free) eventhough the times set by textile-suit swimmers. because the swimmers have the advantage from shiny-suit "pacemaker" swimmer beside him/her, who help him/her to get the better time. if we include Sara Isakovic's time in 200m free, we must include Lisbeth Lenton's time in 100m free (52.99), who doesn't included in the list because she swim beside Michael Phelps ("her pacemaker") on her lead-off leg of mixed-relay. I think it's better we make Missy Franklin in the list with her 1:55.06 to be the best textile time in woman 200m free. It's fairer. Elizabeth Beisel swam the 4:31.78 in 2011, not 2007. I also agree that Isakovic's time should not have been included. A note on the 07 /08 textile times. Of the girls only Liesel wore what would be approved today. And Evans of course > But I expect everyone here knew that. I think it would be appropriate now for a poll of now many WRs will fall in 2012. Either now, or in about 4 weeks after China and Japan spin their wheels too. 100 and 200 breast, 200 backstroke and 400IM. 200 breast(male) and 100 fly(female) fall. Dias, I think the women's 200 free/fly/IM WRs will not be broken for a LOOOOONG time. I think the m200breast is going to pick up in speed, someone is going to go sub208, but I dont think its time has come yet. The same with Rice's 400medley WR. My guess is that around 7-8 will go. I believe, Leisel Jones' best in 200m breaststroke is 2:20.54 (not 2:20.50). As bo9th Cielo and Ottesen swam their 50 fly in EXTREMELY windy (tail wind) condition resulting in unbelievable times for all finalists, shouldn't you put asterisk next to their 50 fly records (textile, wind)? No way Ottesen would have swum 25.2 fly after only 25.0 free if not for that tail wind. Here is the schedule of Men's events for the US Olympic Trials. Ryan has said he will swim 7 events: 100/200 back, 100/200 free, 200/400 IM and a "mystery" event, which I believe is the 100 fly. Brutal schedule if he decides to do it. I think he'll only swim 100 free prelims, just to post a time fast enough to be considered for 4x100 free relay and I don't think he'll want to swim individual 100 free at the olympics, so that's 5 known events. not as brutal relatively, Phelps' Beijing was more brutal. I don't think he's serious enough in 100 fly, but we'll see. Phelps swam 8 events in Beijing - 5 individual and 3 relays. Can you please tell me which 7 individual events that Lochte is going to swim in London? I'm curious too! He says he's swimming 7, and wants on the relays. But what do you actually think he will make the team in? Kinda funny after all his talk of 11 events, breaking Phelps' record he qualified for 5/6 events....He should think before he talks. I think he swim the 100s just to be considered for 4x100 free relay and 4x100 medley relay (the swimmer who swim in heat still got the medal isn't it? And USA most likely grab gold medals in medley relay). So he can get more gold medals. 200 free, 200 back, 200 IM, 400IM and all relays (7 gold medals maximum). 7 events at trials...really Ryan? If he only swims the relays in the heats, he will be doing a great service to Team USA, but in the end his achievement won't be nearly as comparable to Phelps imo. Lezak was the reason they won the 4x100 free but on the medley relay final Phelps brought the USA from 3rd place to first for Lezak. Lochte was out touched by Grevers for 100 bk spot in 08. With Peirsol gone he has a shot of making the team (though there's also Thoman and Plummber. But getting gold? My money is still on Lacourt! I believe Phelps will win the 200IM, but say Lochte wins that and say he wins 200free (not sure bout that one), 400IM, 200bk and the US wins the 4x100medly and 4x200free...that's 6 golds. 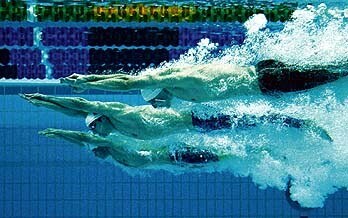 Any others would need a miracle like Lezak or Phelps' 1/100th second win. I'm rambling, though I was really trying to be realistic...woops! If Ryan can have the 3rd fastest 100 free time after Trials (behind Adrian and Phelps) then, yes, he could swim on the 4x100 Medley in the prelim heats as the freestyle anchor. I think this would give him the best shot of being on all 3 relays. Sun Yang's lowered his 1500 as well! It seems a small amount of Lithuania popped up on the list. If Rebecca Soni is erased completely after the World Championships, her comeback after a year off will be more certain and determined. Thanks many for this informative post. i am also doing stitching work in my free time. I have learn stitching in the ditch which is used in several different ways such as top stitching method where two pieces of fabric create a seam. You missed Manadou's 21.19 50 free from Kazan last year.